Jodie Comer and Sandra Oh in Killing Eve. It’s here at last, one of the best, most acclaimed and sizzling series of the year. 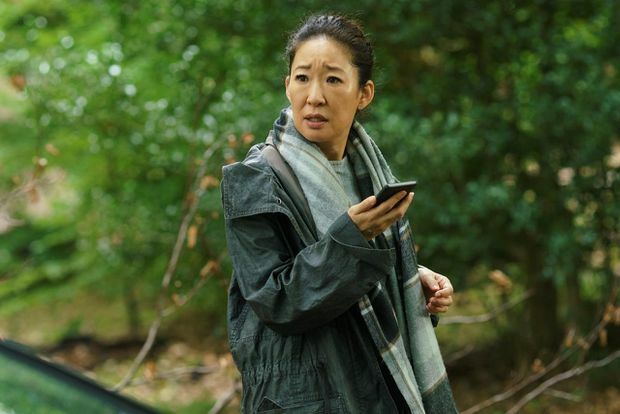 It’s here late and Canadian Sandra Oh is already Emmy-nominated for her starring role in it. Killing Eve (Sunday, Bravo, 9 p.m.) is made for BBC America and made its debut there in April to sensationally good reviews. Presumably, Bell Media/Bravo got the rights but held on to it to replace The Handmaid’s Tale when that series ended. Such is strategy in Canadian TV. Well, it is here and is it unmissable, a killer of a thriller with loads of dry wit and two brilliant performances. It has a unique tone, fun but anti-conventional, and a lot of you are going to love it. Based on the Villanelle series of novellas by Luke Jennings, Killing Eve is adapted by Fleabag creator Phoebe Waller-Bridge, who acts as an executive producer and writer of several episodes. In broad structure it’s a cat-and-mouse spy that might feel familiar. There’s a coolly efficient assassin murdering people in various European countries and an MI5 agent from Britain is tasked with finding the killer, stopping the murders and, if possible, figuring out what’s behind the killing spree. Here, however, the assassin is a woman, Villanelle (Jodie Comer) and she is as evil as all get-out. Also stylish, versatile in her modus operandi, multilingual and fiendishly clever. What emerges immediately, as we see her flit about Europe from Vienna to Paris and Tuscany, is that she genuinely enjoys killing. Takes enormous pleasure in it. It delivers spasms of peak bliss. And this is not a matter of revenge against the patriarchy or such. This woman is just formidably cruel, a sinister sadist, fabulously well-dressed, who really likes inflicting pain. Would she help an elderly woman carry heavy garbage down the stairs? No, she just grins and smirks at the thought of the pain. Meanwhile in London MI5 officer Eve Polastri (Oh), a down-to-earth woman with a slight tendency toward flaky humour, is wishing and hoping she gets to do real spy-catching work. Mostly she does mundane tasks and her skills as a criminologist are unrecognized. Along comes the Villanelle case. Oh is already Emmy-nominated for her starring role in Killing Eve. What is truly notable here is the jaunty tone and its integration with scenes of brutal murder. The MI5 we see here is like an office where the staffers are hungover from someone’s birthday party and the last thing they want to see is the glum boss who runs the Russia desk (Fiona Shaw) turning up with a difficult case to solve. But she does and all she’s got is a case of murder and the victim’s extremely drunk girlfriend in custody. How Eve handles all of this plays out as part farce, part brilliant detection and part common sense. The flavour of it all, meant to keep the viewer off-balance, is delicious. It’s not giving away much to say that, initially, Eve messes up, big time. Then something happens that puts her and Villanelle on a collision course, and what a course it is to travel. It’s important to note that Killing Eve isn’t merely great, addictive drama because roles usually given to men are made-to-measure for women here. The series has an emphatic visual impact, shifting from one gorgeous place to another but subtly taking us inside those places where something very rotten is going on. It could be human trafficking. It could be drug trafficking. There are beautifully made short scenes, icily confounding, that make this more than a thriller set in glamorous places. Further, there is a wicked sense of humour at play. Eve is flaky but self-aware and whip-smart in her understanding of her own weaknesses. And, as it happens, so is the cool assassin Villanelle. These are two very layered characters engaging in something that only they understand. There is fine pacing, too, as it seems like an adrenaline-fuelled thriller at first but then locates its rhythm in the ordinary and mundane. There’s a superbly chosen soundtrack, which anchors the Euro-trash music-video feel and, at the same time, it pauses to savour food and wine and the sheer pleasure of indulgence. It’s a heady mixture, difficult to cook to perfection but here that is achieved. You can see why Oh got the Emmy nomination. She’s inhabiting fully and enjoying the weirdness of the character. Comer should have been recognized, too. Killing Eve is at once light, searing, goofy, funny and macabre. The must-see drama of the summer.